Recalling our first week here, my first thought was, “Now what?” Months of preparation and worry had brought us here. Organizing our stuff, making lists, shopping for essentials…I am really good at these things, especially the shopping part! But the thought of getting settled into a routine, making new friends and finding ways to occupy my time was very daunting. Little did I know that a host of angels lived in my building. My husband’s boss and his wife – I will call them Mr. & Mrs. Boss Man – are a wonderful, gorgeous Canadian couple, whom we have come to really enjoy. Unfortunately, they are on their way out of the country. Another couple, I will call them Mr. & Mrs. Adventurous, are the kind of people who always find the coolest, off-the-beaten-path activities and delight in taking on a place at its roots. Yes, they will be leaving soon, too. Such is the friendship-life of an expat. You make a friend and then they leave. But, just as people are always leaving, there are also new people continually arriving. Expats are an inherently friendly bunch, and know how to hit the ground running. Never knowing how long you will be in a place makes you all the more anxious to get started exploring. No time like the present. 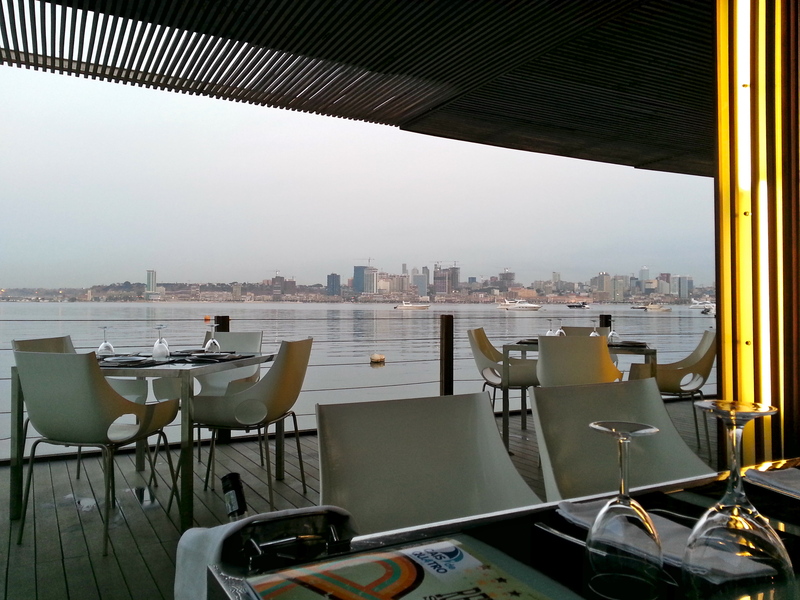 That first weekend, Mr & Mrs. Boss Man took us out to a very fancy restaurant on the water called Cais de Quatro, a lovely open-air place with great seafood and sushi. 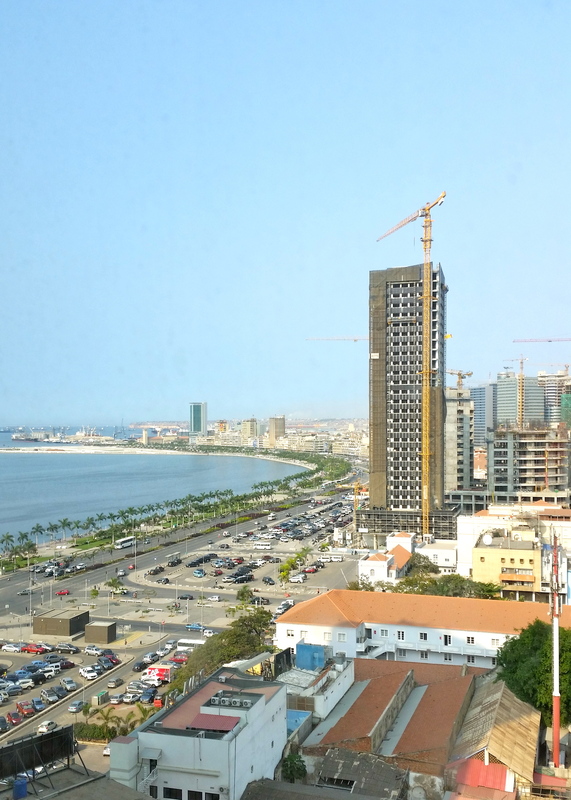 At night, it looks over the Luanda skyline, with all of its large, well-lit office buildings. If you squinted a bit (to block out the building cranes and other eyesores), you could pretend you were looking at the New York skyline. The food and conversation were both delightful, and we finally took a full breath and relaxed into our new lives. Sunday morning, Hubby and I went for a walk on the Marginal, a newly refurbished stretch of coastline in front of the main part of the city. In a place where walking more than about a block is strongly discouraged, this little four mile walking area is a God-send. Every one of the people we saw, except for the occasional guy passed out on a bench from a Saturday night of drinking, was just out enjoying the day. Walkers, runners, bikers, roller-blading children, and couples with strollers were such a nice sight to see! I was so worried that I would feel like a caged animal in my apartment complex – the “Cruise Ship on Land”, as the residents call it. 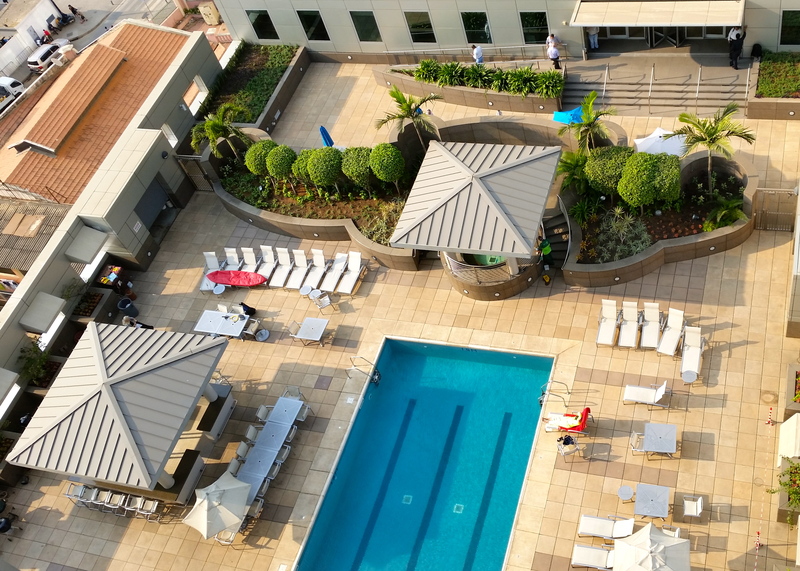 Our eleven story apartment building is connected to an even taller office building by a pool deck, complete with a bar area, grills and plenty of space to entertain large groups. View of the office building from our tenth floor flat. View of the pool deck that connects our flat to the office. Not a bad commute! The walk went well, except for the occasional waft of a terrible smell from large pipes emptying something-we-won’t-talk-about into the bay. Smells are just part of life here. I will have to put my American sensitivities on the back burner and just deal with it. After the walk, as we were approaching the entrance to our building, a very agitated young man began yelling at us in Portuguese and walking quickly towards us. Hubby picked up the pace and we managed to slip into the building just before we were intercepted. Not gonna lie – that scared me a bit. Hubby said there is usually a Tango Delta car parked out front (identifiable by a reflective strip on the car door), and that I can knock on the car window for help, if that ever occurs again. Good to know. The next week was spent unpacking my suitcases, getting to know some of the ladies in the building (did I mention they are angels? ), and visiting a few grocery stores to stock the pantry. When we came on our look-see visit one year ago (relocations take extremely long here, due to a cumbersome visa process), the grocery stores I saw were small, poorly-lit, smelly (I know, got to ignore this! ), and more than a bit short of what I considered cooking essentials – that is, convenience foods. I’ve never been a great cook, mostly because I am just lazy and would rather go out, and living in London just played right into that. All of the grocery stores there have row after row of pre-made meals that are really delicious and very high quality. After three years there, I could count on one hand the number of times I made a meal that required a measuring cup or recipe. If it required a heat source (i.e. a microwave) then I considered it cooking. Pure bliss! The grocery stores here have improved vastly from one year ago, but the convenience foods have yet to arrive. Folks, I gotta learn to cook. This is not an easy thing for a fifty-something gal who is more than a little spoiled. However, before you can buy food, you need CASH. This place runs on cash, cash, and nothing but cash. And the banks are not the place to go and get it. As instructed, we had brought from the US our stack of clean, new $100 bills – strapped to our bellies in a money belt. One morning, I grabbed five bills, took a deep breath and walked out of the building to the corner money-changer-lady named Luisa. She sat on a chair, accompanied by a half-dazed boy laying across a motorcycle, and was dressed in yards of colorful African batik, with her head wrapped in a coordinating fabric. I walked up to her, stuck out my hand and introduced myself. She looked at me like I was definitely from out of town. Just give me the money, she clearly thought. I fumbled through my pockets and pulled out the bills, more than a little alarmed when she immediately got on her phone and started yelling something in Portuguese. I had no idea what was happening, so I stood nervously, looking over my shoulder and waiting for someone to try and rob me. Hello, you numbskull, I finally realized. Luisa was holding the cash, not me, and she was not the least bit nervous. After what seemed like twenty minutes, but was probably only about five, a young man came running up with a large bag full of cash. There must have been thousands in that bag! Luisa gave me the Kwanzas, I said a quick “obrigada” and headed back inside. Mission accomplished. We will not starve today. The pantry was stocked, mostly from local grocery stores, but also through street produce sellers. 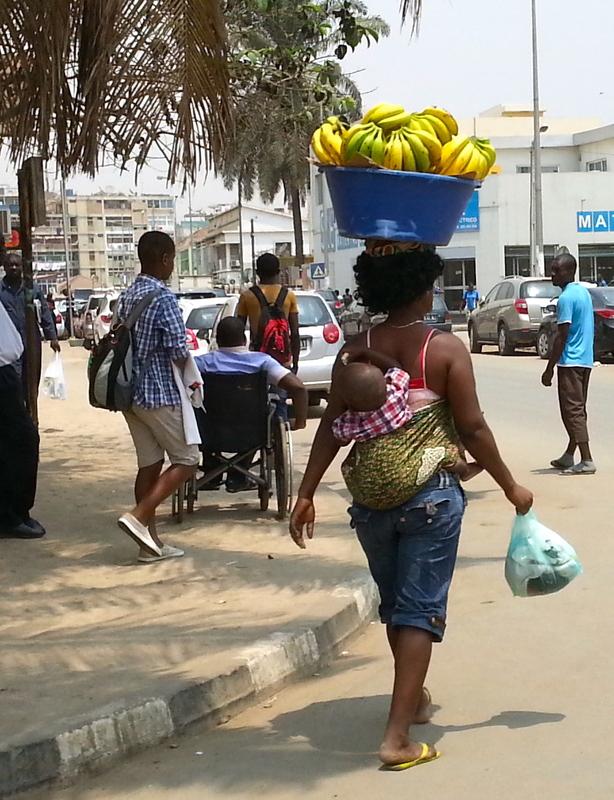 These ladies carry large buckets on their heads of wonderful, fresh avocados, tomatoes, bananas and the like. You simply hand them whatever you want to spend and they fill up a bag for you. I bought a bag of about eight beautiful Roma tomatoes for $2.00 – a real bargain as they would have been triple that in a store. This particular lady, who was sitting cross-legged in the street, had a toddler nursing at her breast the whole time she was picking out my tomatoes. She kept swatting at him, but he would not let go. Kids! What are you gonna do? The rest of the week was spent learning how to disinfect the produce (my new best friend is bleach), fumbling through a few recipes found online, and then the week was done. I felt like a local already – not! Great post. Great blog!! What an adventure, and your positive attitude is infectious. Prayers for safety and adventure for you! Thanks so much, Cassie! I always enjoy your blog as well!! Best of luck on your new adventure, too! Safe Travels!